Based on research of 150 websites from membership-based organisations in and around Brussels in January 2015. 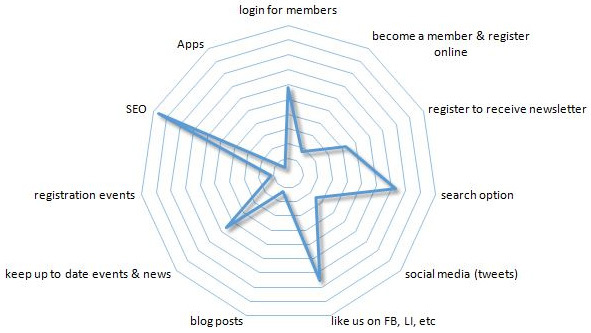 StarfishMRM has identified 11 success indicators for the online presence of Brussels-based associations. Is your organisation making the most of its online opportunities? Recent research by StarfishMRM, the online systems specialists for membership organisations, shows there is ample room for improvement, including use of CRM (customer relationship management), integration of social media and online registration for events and membership enquiries. Less than 5% of associations surveyed have their own mobile app. Quality of information and communication is key to be successful as a membership based organisation. Associations are platforms to share ideas and form opinions, groups that build alliances to provoke change. For centuries, humans have collaborated to reach their goals. But how do membership based organisations in and around Brussels interact with their audience today? StarfishMRM has researched the websites of 150 membership-based organisations in and around Brussels. By 2014, 80% of Belgians had access to the internet, compared to 25% in 2000 (1). Smartphone penetration has gone from 35% of the population in 2012 to 58% in 2013 (2). Mobile reach is greater than ever, and its continuing adoption is changing not just consumer behaviour but also business strategy (3). Associations exist in all sizes. From the local pottery club to worldwide humanitarian aid providers or defenders of the rights of pharmaceutical companies. Whatever their size, they all need to find the best way to reach their audience. "We found that leaders of membership organisations are quite often early adopters of mobile technology in their personal lives but may be reluctant to bring their organisations up to the same level because they fear this would be too complex or too costly." says Hanneke de Visser. "Sometimes it is a matter of dipping your toes in the water, it may not be as cold as you feared!" according to Glynis Whiting, both Partners at StarfishMRM.